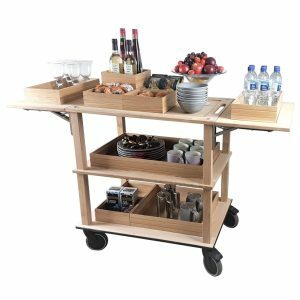 Ligneus launches the modular Burford Trolley Range offering high end catering trolleys. It is available in compact and drop leaf options and interchangeable stack-able oak trays. This offers a premium hospitality & catering service with efficient clear-down function. This versatile serving trolley system can be tailored to suit your needs. It works extremely well from the executive boardroom to the finest of restaurants. The trolleys themselves offer plenty of capacity however the real advantage is the interchangeable and stackable components. They not only offer a tailored display but allow for the efficient replenishment between front-of-house and back-of-house.